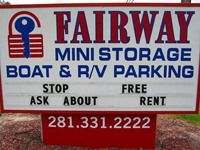 In Alvin Texas it is Fairway Mini Storage, Boat & RV Parking. When you need to store your RV we have exactly what you are looking for. A safe and reliable storage facility to keep your RV. RV storage at Fairway Mini Storage & RV Parking is a cost effective and a safe option for all owners. There are many benefits to RV storage at Fairway Mini Storage, Boat & RV Parking . We offer the latest security with digital cameras recording 24/7. The entire facility is gated with access allowed only through PIN identification and we also have an on-site manager. All employees go through a complete background check. For additional information on RV storage please feel free to contact us. Our experienced staff will be happy to help you find the perfect RV storage soace to fit your needs. Call us at: (281) 331-2222 to reserve. You may also reserve your RV storage online..